With a new president and new apostles, Mormon General Conference is sure to make history, but will speakers touch on timely topics? (Scott Sommerdorf | The Salt Lake Tribune) Members of the Relief Society stand to sustain top church leadership on April 5, 2008. No doubt, this weekend’s LDS General Conference will be historic. 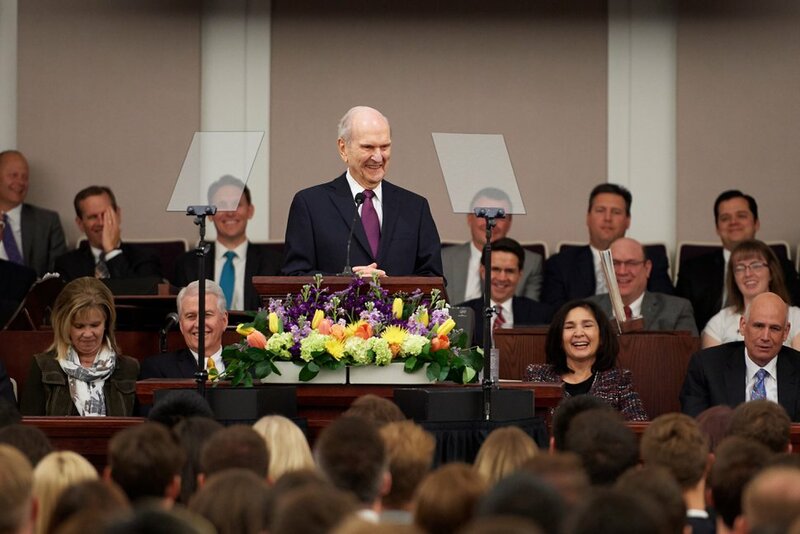 In a ritual known as a “solemn assembly,” reserved for sacred occasions, Mormons across the world will stand and raise their hands to show support for 93-year-old Russell M. Nelson as the faith’s 17th prophet of The Church of Jesus Christ of Latter-day Saints. Unlike the past few years, when President Thomas S. Monson was suffering the effects of advancing age, Nelson — the second oldest man to ascend to the top — could conduct any or all of the five sessions. Two new apostles are expected to be appointed to fill the red seats on the dais left vacant by the deaths of Monson in January and apostle Robert D. Hales in October. Observers wonder if at least one may be a man of color or hail from outside the U.S. Unlike any time in recent decades, the conference will have no “women’s session” — that meeting will happen instead in the fall in place of the all-male priesthood gathering — and, if precedent holds, the Young Women presidency will be released after five years and new leaders named. On top of that, LDS leaders could announce plans to build new temples or implement new policies (including the ever-popular grass-roots speculation of shortening the three-hour block of Sunday services to two hours). 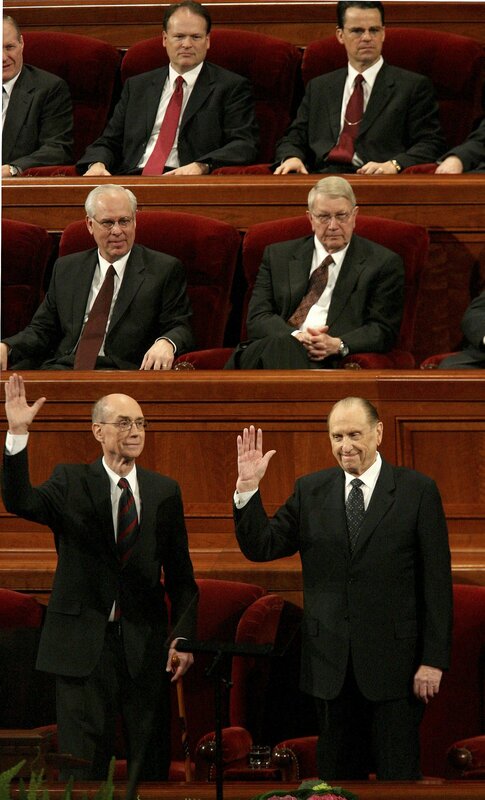 (Scott Sommerdorf | The Salt Lake Tribune) President Thomas S. Monson (right) raises his hand alongside President Henry B. Eyring as they sustain top church leadership on April 5, 2008. Connecting past and present • During one session, Mormons will perform the solemn assembly, a ceremony that was initiated by church founder Joseph Smith to emphasize group solidarity and commitment. Each priesthood quorum, made up of males divided by age and level of responsibility, will stand separately to show its support for their new leader, followed by adult women, then girls ages 12 to 17. In the end, the world’s nearly 16 million Mormons will have the chance to offer the affirming gesture wherever they are, either in the LDS Conference Center in downtown Salt Lake City, in Mormon chapels or in front of their TVs or computer screens. 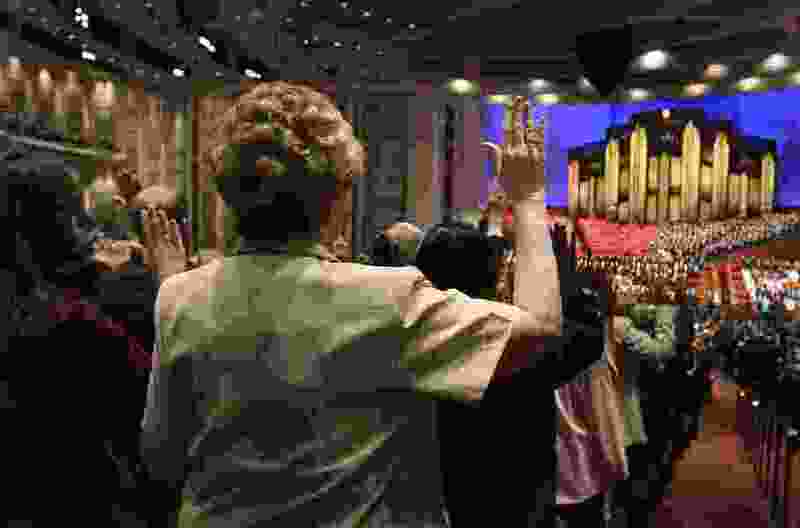 This year’s solemn assembly will showcase the church’s continuity from its founding days — even as it highlights changes wrought by the late President Gordon B. Hinckley, who added the separate female voting to be more sensitive to women. (Courtesy LDS Church) LDS Church President Russell M. Nelson addresses young adults at a fireside in Las Vegas on Feb. 17, 2018. Not necessarily newsy • What’s not likely to happen at the upcoming global gathering, though, is any sermon that details recent controversies surrounding gun violence and sexual abuse. Listeners probably won’t hear anything about the case of Joseph L. Bishop, the LDS Missionary Training Center president in the 1980s who has admitted sexual misconduct with female missionaries. After all, Mormon higher-ups just this week released revised guidelines for local lay leaders who interview children, teens and women, and counsel abuse victims in their congregations. They may hear little or nothing about the school shooting in Parkland, Fla., the #MeToo movement or the Black Lives Matter push. During these semiannual LDS conferences, for instance, there was no mention of the 1989 excommunication of George P. Lee, the church’s first American Indian general authority, says Salt Lake City-based historian Ardis Parshall. Nearly 30 years later, no speaker discussed the same action taken last summer against James J. Hamula, a member of the Seventy. This is hardly surprising to Latter-day Saints. General Conference speeches are written far in advance and go through layers of review by the speakers, then are polished and translated into scores of languages before being given. In the past couple of decades, however, there were a few comments about news of the day, particularly by Hinckley, who was at ease with timely subjects and off-the-cuff remarks. The former president, who died in 2008, noted the start of the U.S. war in Afghanistan as the bombs began falling in October 2001. He discussed the sin of racism in 2006 and the horrors of abuse in 2002. During the April 2005 General Conference, Hinckley got word that Pope John Paul 11 had died and remarked on the Catholic pontiff as a man of great faith. The new Mormon prophet could follow suit. In addition, the first position taken by the church under Nelson on a major public policy tackled the touchy topic of immigration and urged Congress to act quickly to protect from deportation hundreds of thousands of “Dreamers,” whose undocumented parents brought them to the United States as children. Barely a week after the conference, the former heart surgeon and his wife, Wendy, will depart April 10 for an 11-day trip to eight nations on three continents. Though he is in his 10th decade, the seemingly inexhaustible Nelson could surprise everyone.